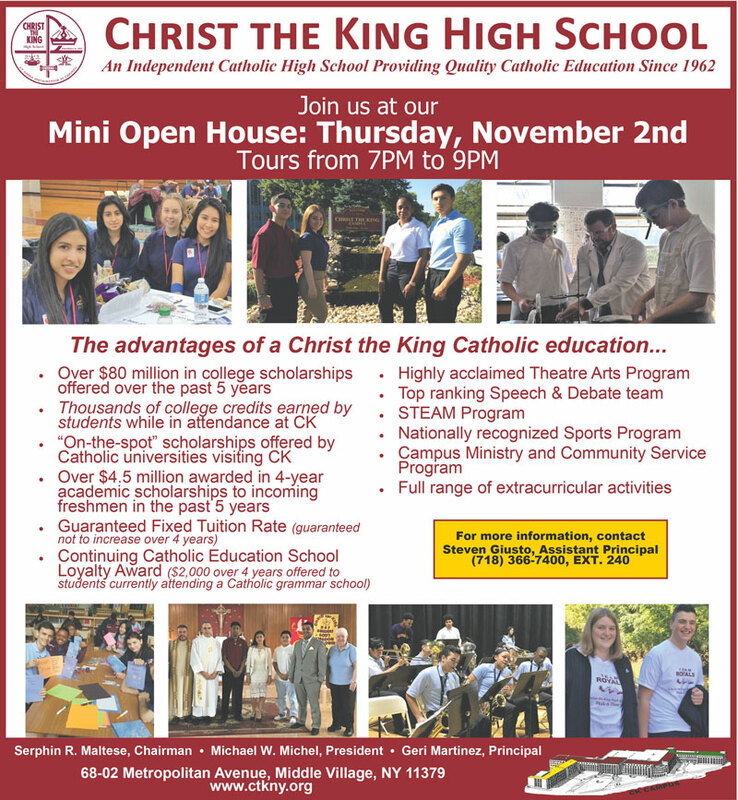 Located in Middle Village, Christ the King draws students from all areas of the city. The school is accredited by the Board of Regents of the State of New York and the Middle States Association of Colleges and Secondary Schools. It is dedicated to creating an atmosphere in which all members of the student body can attain a high level of achievement based upon their unique abilities and relationship with God. 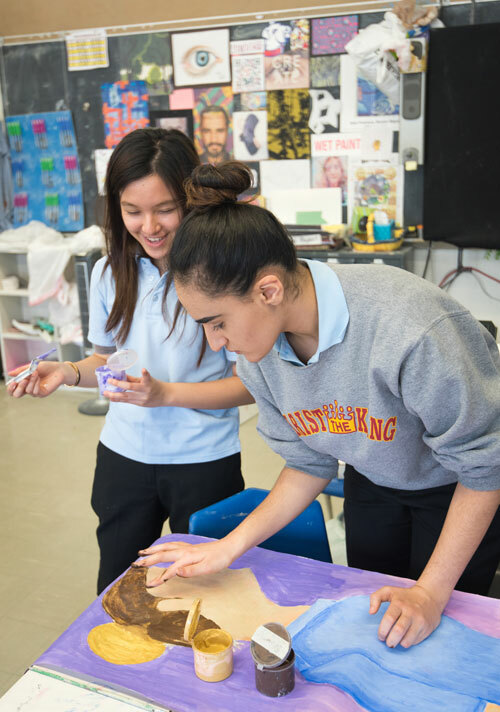 Christ the King has reached a level of academic distinction making it one of the most sought-after private high schools in New York City. Each year, students achieve academic excellence that results in millions of dollars of scholarships from colleges and universities across the nation. 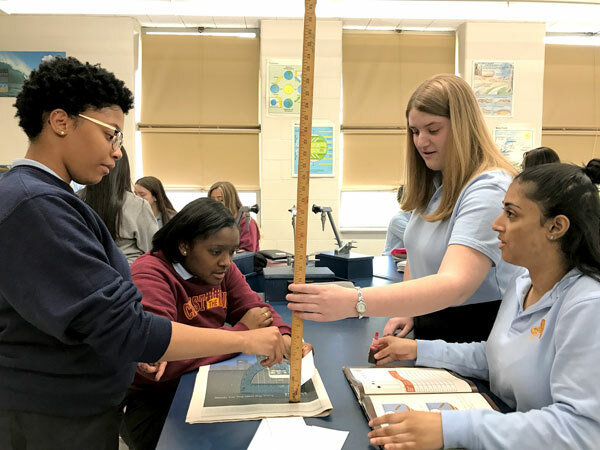 Christ the King’s dedicated teachers and support staff have demonstrated both the knowledge and commitment to make its academic program second to none. English – English 9, American literature and British literature. Seniors may choose from AP English, public speaking/creative writing, humanities and world literature. Mathematics – Common Core: algebra; Common Core: geometry; Common Core: algebra 2; algebra II. Electives include: Math 12, statistics, pre-calculus and AP calculus. Science – Living environment, earth science, chemistry, physics. Courses are also offered in forensics, anatomy and physiology, environmental science, AP biology, and a mentoring program in advanced research. Social Studies – Global history and geography I and II, U.S. history and government, government and economics in addition to AP world history, AP U.S. history and AP U.S. government and politics. Electives include: psychology and sports psychology. Religion – Courses offerings include Catholic Foundations I and II, Hebrew and Christian Scriptures and the Christian Way of Life. Community service is required for all sophomores, juniors and seniors. Foreign Language – There are four-year sequences offered in American Sign Language, Italian and Spanish. Up to six transferable college credits from St. John’s University can be granted in American Sign Language, Italian and Spanish. Technology – Advanced technical programs are offered during the regular school day. Courses include intermediate computer science, advanced information technology and AP computer science principles. Students enter the program in sophomore year and continue until graduation. Students are encouraged to take the Microsoft and Certiport certification exams starting in the intermediate computer science course. Fine Arts – Freshmen may choose from band, chorus, dance, studio in art, or theatre arts. Electives include: advanced band, concert chorus, intermediate and advanced dance, ceramics, drawing and painting, theatre arts and broadcasting. Christ the King also offers an honors track for ninth through 12th graders as well as the opportunity for juniors and seniors who excel to participate in St. John University’s College Advantage Program. Available to the students are a wide array of award-winning clubs and activities, including the math, and speech and debate teams, which have consistently been ranked within the top place winners amongst hundreds of high schools throughout New York State. Students can choose to join clubs and activities such as art, book, broadcasting, chess, dance, drum corps, forensics, journalism, marching band, mock trial, National Honor Society, newspaper, photography, prevention leadership, robotics, technology, student association, theatre arts, video-yearbook, writing for fun and yearbook. Christ the King High School also has a nationally renowned sports program including: basketball, baseball, bowling, cheerleading, football, golf, handball, soccer, softball, step, track and volleyball. Christ the King students have scored as high as the 99th percentile on recent SATs. Graduates have gone on to attend nationally ranked colleges and universities, including MIT, Pennsylvania State, Georgetown, Duke, NYU, St. John’s, Howard, Adelphi, Hofstra, Fordham, St. Francis, Pace, Skidmore, Boston College, Macaulay Honors Program at CUNY, University of Connecticut and U.S. military academies, such as West Point and the Air Force Academy. The Board of Trustees of Christ the King High School recognizes the sacrifices that families make to ensure a quality Catholic education for their children. This award is offered to students who currently attend a Catholic grammar school/academy. This award totals $2,000 over the course of four years. Families are guaranteed that a child’s tuition will not increase while attending the school.